Written by Angus McLeod for OpenInvest. My nan (and, probably, her nan) used to say, “Don’t put all your eggs in one basket”. It’s sage advice, and well worth following. Its intention is to prevent you from losing everything at once; if your assets are spread around in different ways then your total wealth won’t be seriously affected by a downturn in any one particular investment. While my nan might have been a wise old lady, in 1952 an American economist named Harry Markowitz devised Modern Portfolio Theory which took the “eggs in baskets” concept a few steps further. He even bagged himself a Nobel Prize for his efforts. Modern Portfolio Theory takes this ancient wisdom and extends it with some impressive maths to show that blending certain assets in a portfolio can have some interesting and powerful results. These days we call the blending of assets “diversification” and it’s now considered one of the most important concepts in investing. It’s important because of the special relationship that arises when the prices of assets in a portfolio don’t move in the same direction or move by different amounts. First, let’s start with some basics. It’s well-known that asset prices move both up and down; that each asset class’s prices fluctuate over time. By ‘asset class’, we mean the broad category that an investment falls into – Cash, Bonds, Equities, and Property, being the main ones. What you may have noticed is that some asset classes’ prices move the same way and some move in opposite directions. 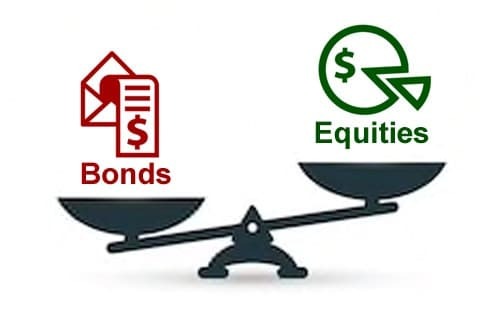 A classic example is equities and bonds which have been shown to move in opposite directions: in general, when equities go up, bonds go down, and vice versa. The relative price movements offset each other, more or less, and can help to smooth the returns on investments. What Markowitz found was that it’s the extent to which asset prices move in relation to each other that gives investors the greatest benefit of having their eggs in different but complementary baskets. His most surprising and significant conclusion was that investors can get an unexpected benefit from diversification, which has been referred to as ‘the only free lunch in finance’. He was able to show (with some complicated maths that we’ll skip over here) that the less asset classes move in the same direction the greater the benefits of mixing those assets in a portfolio. Continuing with our example of bonds and equities, the chart shows that if we have only equities in a portfolio the risk (measured by standard deviation of returns) is 20% and the expected return is 18%. 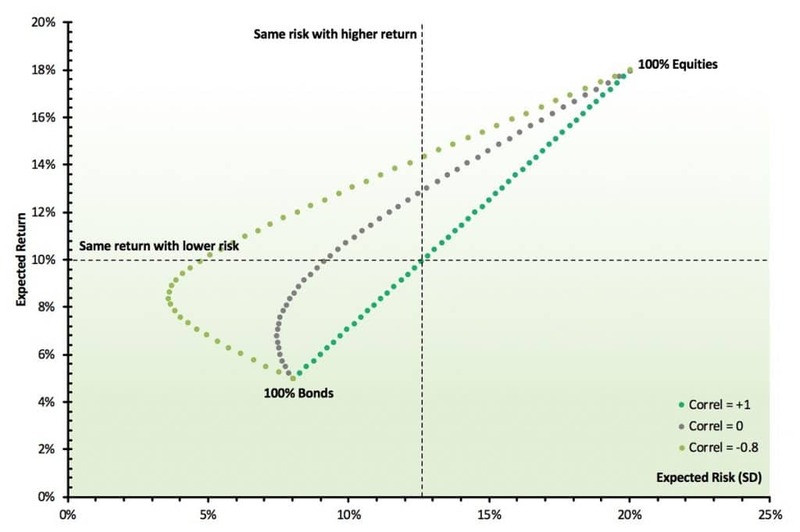 If we have only bonds in our portfolio the risk is 8% and the expected return is 5%. It’s when we begin to blend these two assets that the interesting result becomes clear. The chart shows three dotted lines: one where the two assets’ price movements are perfectly correlated (dark green), one where they are uncorrelated (grey), and one where they are negatively correlated (light green). 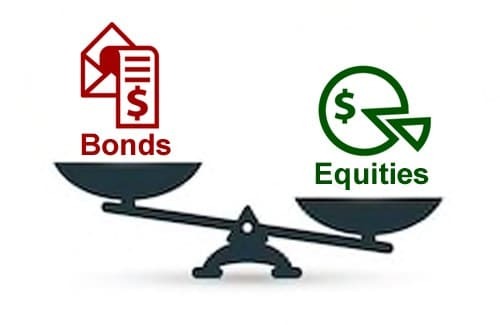 When two assets have a correlation of +1 there are no benefits from diversification and the resulting risk and return of a blended portfolio is simply the weighted average of the two assets’ risk and return. However, it’s when the correlation is less than +1 that the remarkable Markowitz result starts to show. The resultant portfolio is able to have a higher return for the same level of risk or the same return for a lower level of risk. This is the ‘free lunch’ of diversification. Without doing anything other than blending two assets with less than perfect correlation we are able to achieve a better portfolio result. In the theoretical example above, we can move from a portfolio with around 12.6% risk and 10% return to one with 12.6% risk and up to 14% return or lower the risk from 12.6% to around 5% for the same 10% return. In short, diversification can lower your risk, or increase your return, or achieve both and it depends only on how you select and blend the assets in your portfolio. Risk and return will vary in the real world, but our example clearly shows the benefits of diversification: mixing lowly correlated assets into portfolios can achieve a better result for investors. It’s a benefit that occurs due to the characteristics of the assets, not one that an investor has to work for. That’s why diversification is such a powerful tool: you get the benefits for free. The benefits of a diversified portfolio don’t end with mixing different asset classes. Diversification within an asset class, such as equities, is just as critical to your investment objectives. While it’s tempting to equate diversification with increasing the number of companies you invest in, as we showed above the benefits of diversification come from investments with low correlation. You can have 20 stocks in your portfolio but if they’re all Australian iron ore companies you are poorly diversified. On the other hand, if your portfolio of 20 stocks includes banks, miners, technology companies, retailers, and pharmaceutical manufacturers, then you’re set up for the benefits that diversification brings. To extend diversification even more, your portfolio can venture offshore to developed markets in Europe and the US. Here, companies’ fortunes are affected by local issues and economics which won’t always coincide with what’s happening in Australia. Emerging Markets offer a further step in portfolio diversification: an Indian firm will be subject to very different forces and possibly be in a very different stage of growth or development when compared to a domestic or US-based company. The diversification concept can be extended to portfolios of any number of assets (the maths just gets a bit more complex), but it should be clear that diversification within and across asset classes, countries, and industries can produce superior outcomes. The benefits of diversification change the dynamic of the trade-off between risk and return and turn the tables in the investor’s favour. What doesn’t change are the benefits to investors of choosing the right blend of investments in a diversified, well-balanced portfolio. As an investor, diversification is your best friend. A carefully-constructed portfolio can benefit from the skillful blending of investments and help to realise your investing goals. For more information, please visit the OpenInvest website. OpenInvest provides access to a range of leading investment managers to give you knowledge, choice and control. Explore and better understand your investing personality and capabilities by taking OpenInvest’s behavioural finance quizzes, Know Thyself. This content has been prepared by OpenInvest Limited ACN 614 587 183, AFSL 504 155 and was originally published by OpenInvest through the OpenInvest Marketplace. The information contained is of a general nature and should not be considered as personal financial or taxation advice that takes into account your individual objectives, financial situation, needs or circumstances. 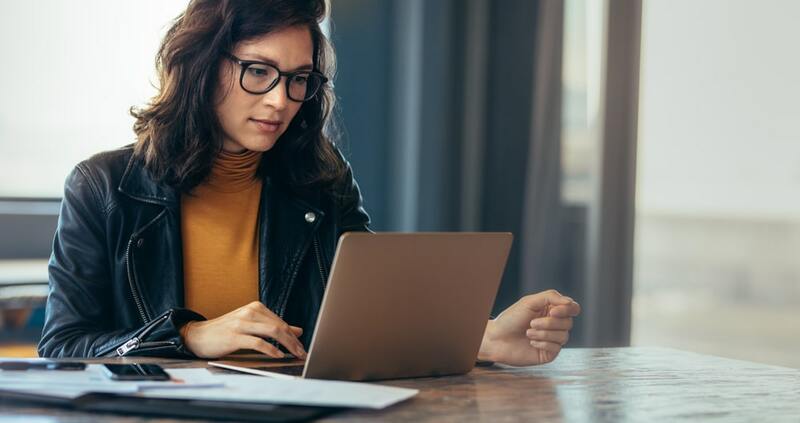 Should you require assistance in making an investment decision, you should consider seeking the services of an appropriately licensed financial adviser.